The use of wheels to convert flowing or falling water into power began in ancient Greece around the third to the first century B.C. In 1878 Lester Allan Pelton, a carpenter and blacksmith from Nevada City, invented a new design for an impulse water turbine. Pelton's wheels would eventually become the standard design for exploiting the energy potential of water. Using high pressure and low volume, Pelton's wheel took advantage of the impulse energy of moving water. Water entered the middle of the bucket, splitting into two streams that followed the contour of the bucket and exited out the sides. This highly efficient and revolutionary design allowed the water to transfer most of its kinetic energy to the wheel more so than any previous design. Pelton wheels are still used around the world in the hydroelectric industry. 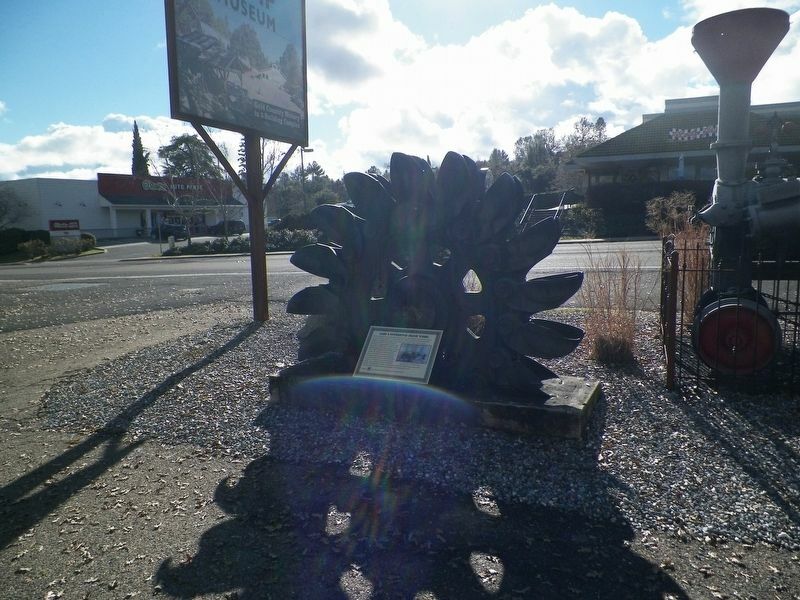 This wheel was used at the Camp 9 Powerhouse on the Stanislaus River until decommissioned and gifted to the museum by P.G&E. Erected by Angels Camp Museum, sponsored by Native Sons of the Golden West in memory of esteemed member Millard Smallin. This marker is included in the Native Sons/Daughters of the Golden West marker series. Location. 38° 4.53′ N, 120° 32.752′ W. Marker is in Angels Camp, California, in Calaveras County. Marker can be reached from South Main Street (California Route 49). Touch for map. This marker and the exhibit are in the horseshoe driveway area of the museum. 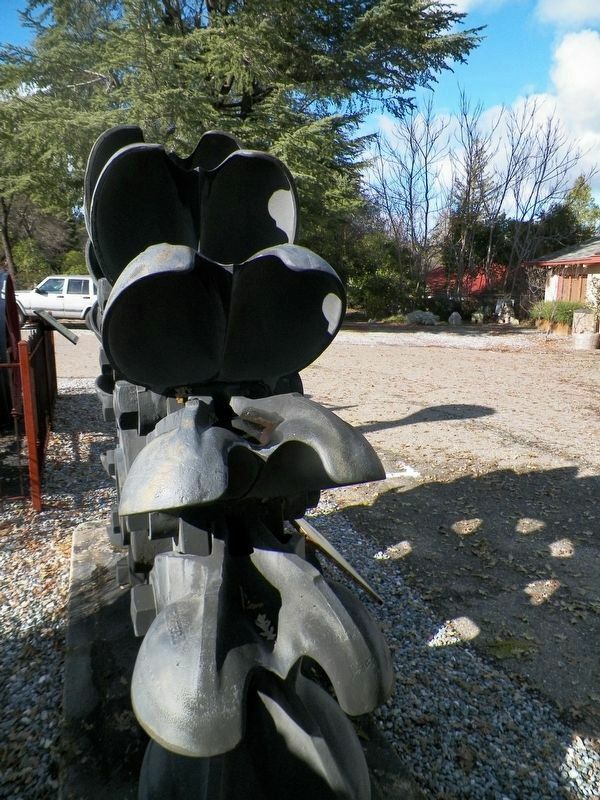 Marker is at or near this postal address: 753 South Main Street, Angels Camp CA 95222, United States of America. Touch for directions. Other nearby markers. At least 8 other markers are within walking distance of this marker. Just Jenny (here, next to this marker); Bells (a few steps from this marker); Signal Cannon/Utica Mine Ore Car/Arrastra Model (a few steps from this marker); Serpentine Drill Core Section (a few steps from this marker); Stalactite/Stalagmite (a few steps from this marker); Ol' Beth (a few steps from this marker); Hogarth Stamp Mill (about 500 feet away, measured in a direct line); a different marker also named The Hogarth Stamp Mill (about 500 feet away). Touch for a list and map of all markers in Angels Camp. 2. Hydraulic Turbines: The Pelton Turbine. More. 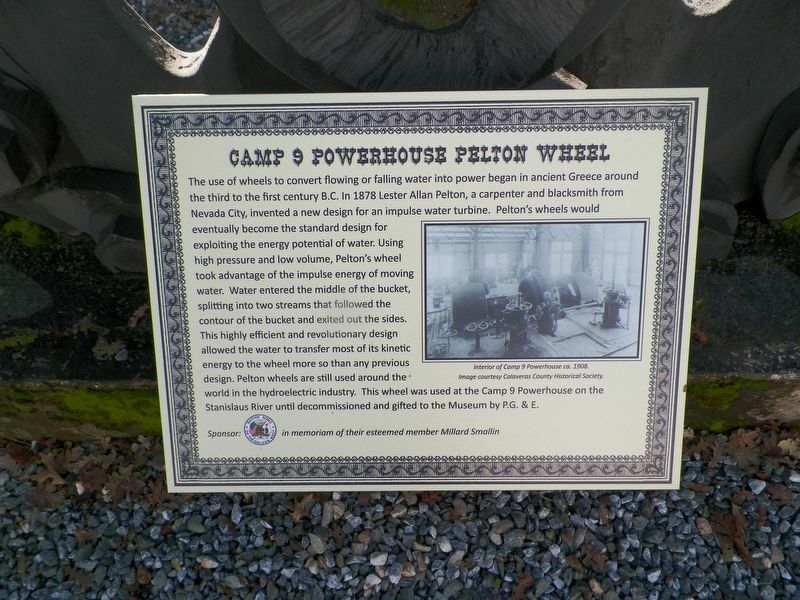 Search the internet for Camp 9 Powerhouse Pelton Wheel. Credits. This page was last revised on August 11, 2018. This page originally submitted on February 26, 2017, by James King of San Miguel, California. This page has been viewed 207 times since then and 9 times this year. Photos: 1, 2, 3. submitted on February 26, 2017, by James King of San Miguel, California. • Syd Whittle was the editor who published this page.